It's my first post here but wanted to share photos of my brand new Crescent 6. Came about 2PM today. Spent the afternoon with her and she definitely has my seal of approval as a lead guitar. Needs a name, though - I am open to suggestions. EDIT1: Massive shout-out to Noble for helping me turn my ideas into reality on this one! I really appreciate all the help he gave me through the process. EDIT2: "Ember" has been suggested for the name and I love it! Perfect name to fit the finish. Last edited by SolidOrangeTiger on Sun Nov 04, 2018 11:12 am, edited 5 times in total. Welcome to the forum! 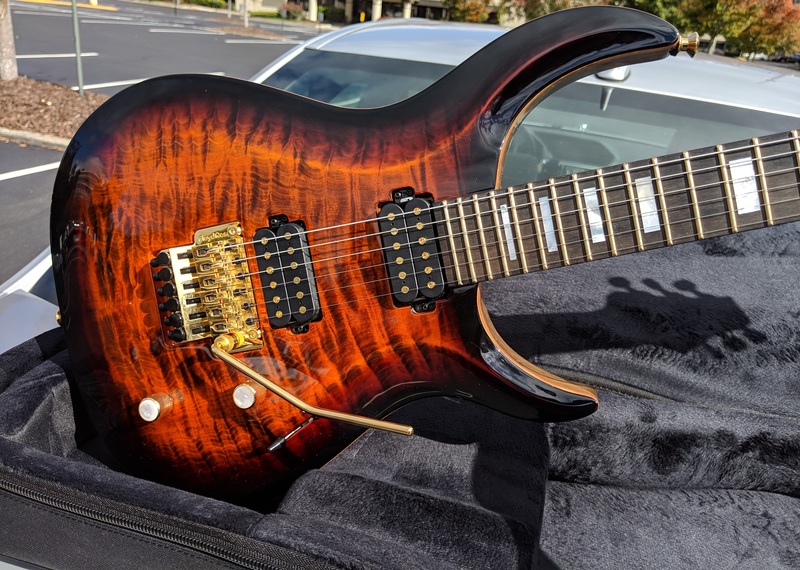 That’s a great looking guitar Happy NGD!!! Fun choosing your options and seeing how it all comes together. I'm going to suggest Ember for the name. That color reminds me of the bed of coals at the end of a campfire. The quilting simulates the way the color ripples across the coals as the airflow changes. Congrats and enjoy that beauty!! Praiser makes a good case for Ember. That's a sweet looking guitar, I love the stripey body too. 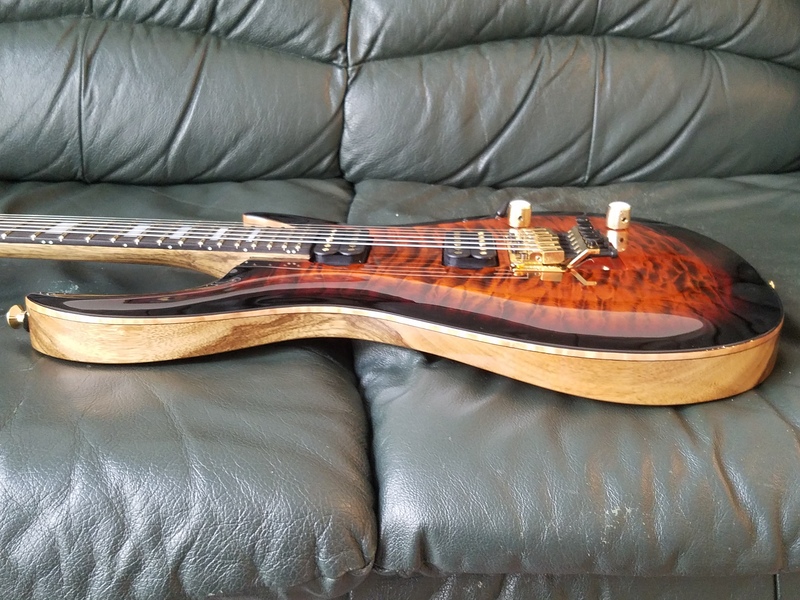 Praiser wrote: Great looking guitar! I'm 100% with you and I love that name! Ember it is. 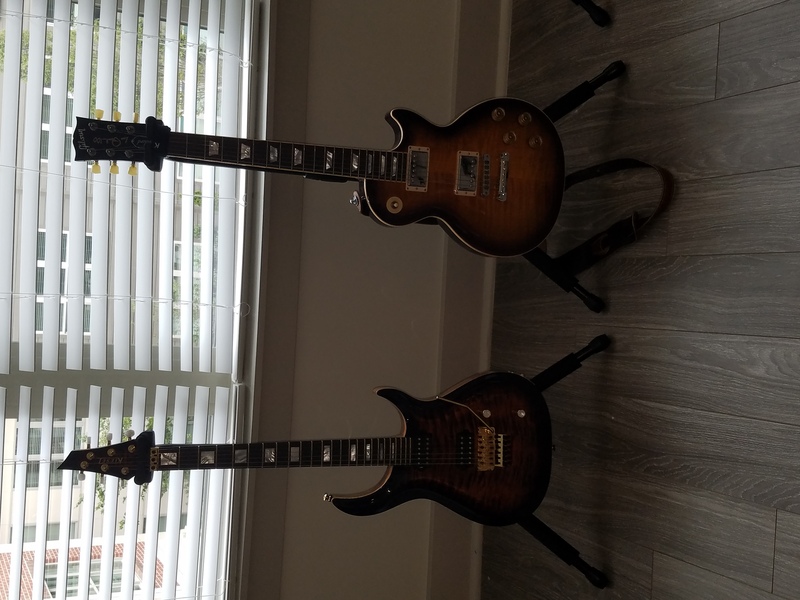 I'm a huge Clemson fan so I knew I wanted Orangeburst, but I went back and forth on the Blackburst Edges. I'm glad I got them, though! They add so much character to the quilt. skully13a wrote: Praiser makes a good case for Ember. 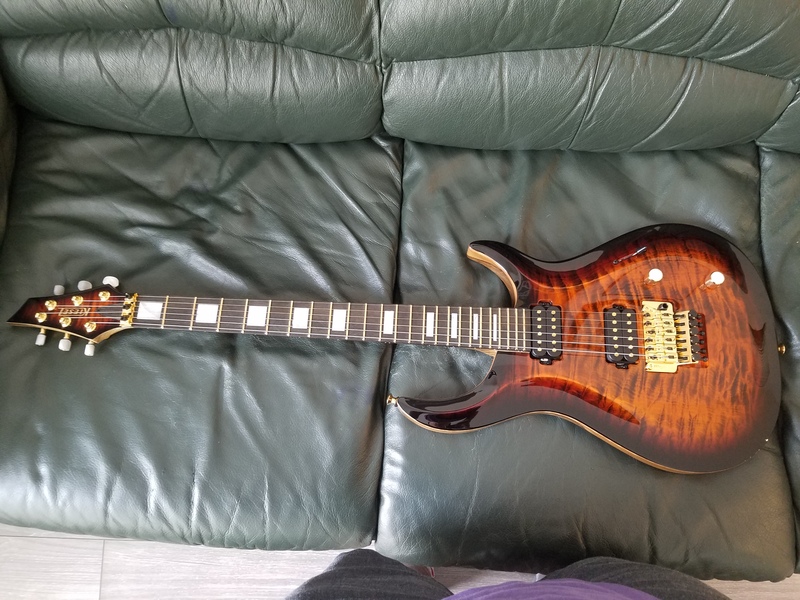 That's a sweet looking guitar, I love the stripey body too. 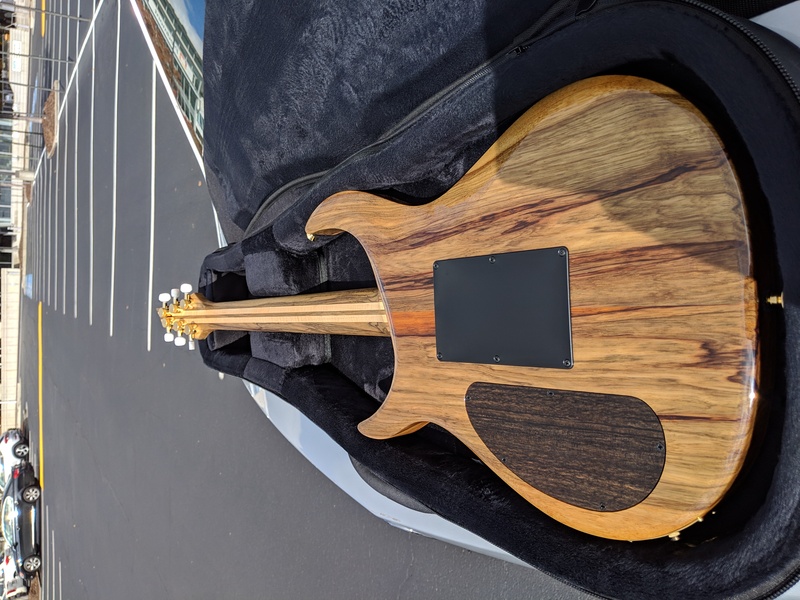 I thought I was ready for the Black Limba wood grain, but even after seeing photos of this guitar online, when I pulled it out the case and looked at the back, it still took my breath away! Very happy I went with it over the usual mahogany (which is also great by the way). dbone wrote: Welcome to the forum! 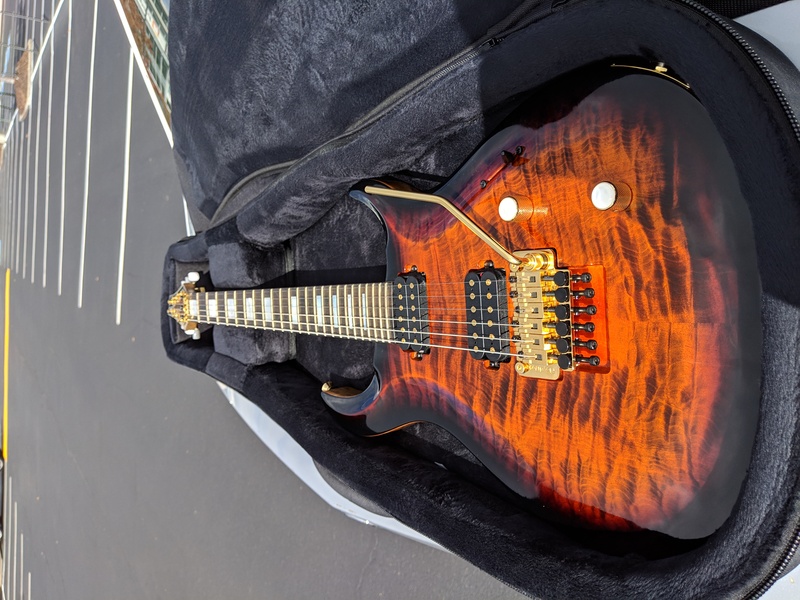 That’s a great looking guitar Happy NGD!!! Fun choosing your options and seeing how it all comes together. Thanks, and it absolutely is fun! Resisting the G.A.S. 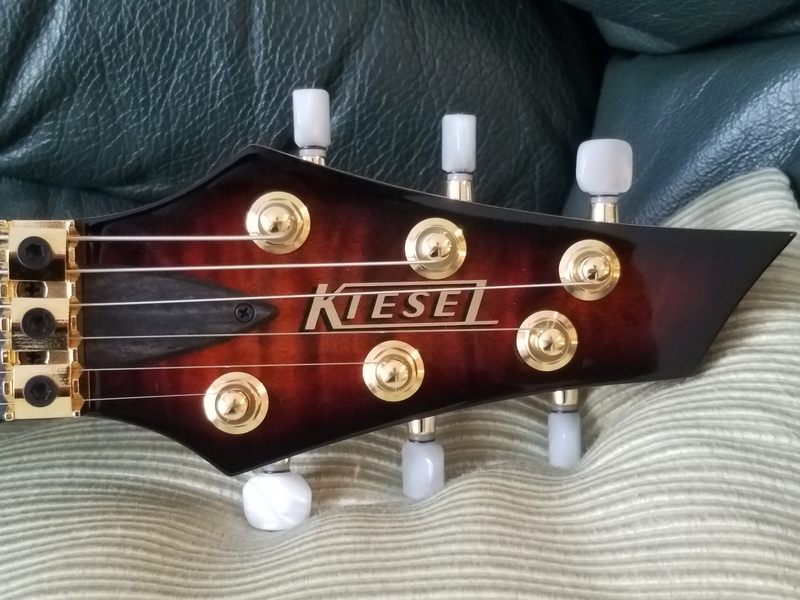 for now, but this definitely will not be my last Kiesel. Cool that you like the name and are going with it. The color on the quilt with the black edge just struck me. Hope you play lots of smoking hot licks on for years to come. May it be an eternal fire of inspiration. The GAS is real and many of us have multiple builds once the first one opens the door. Welcome to the Forum and HNGD! Very nice job spec'n that one out - it's gorgeous. Give us a full tone report after you get some time on it. 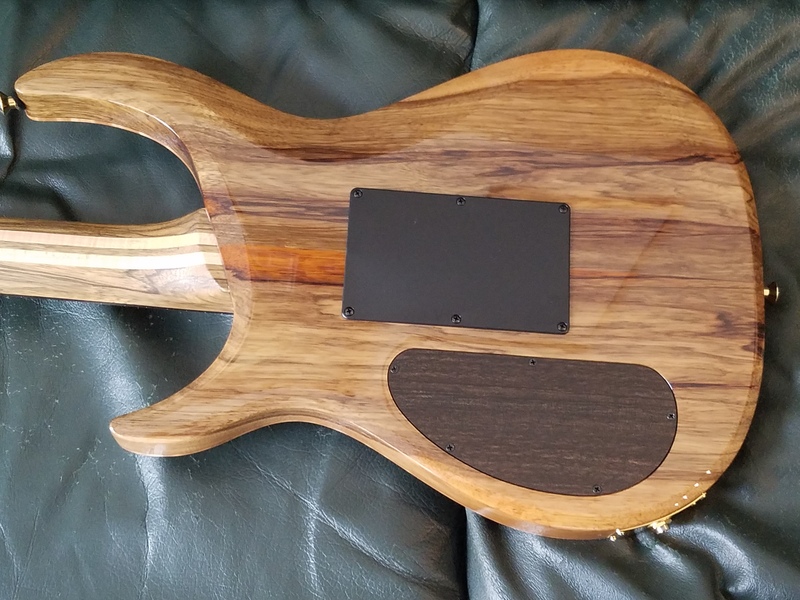 Tone-wise, I think "super-mahogany" is a perfect description of Black Limba and this guitar. Really nice mid range, smooth low end, and warm trebles. 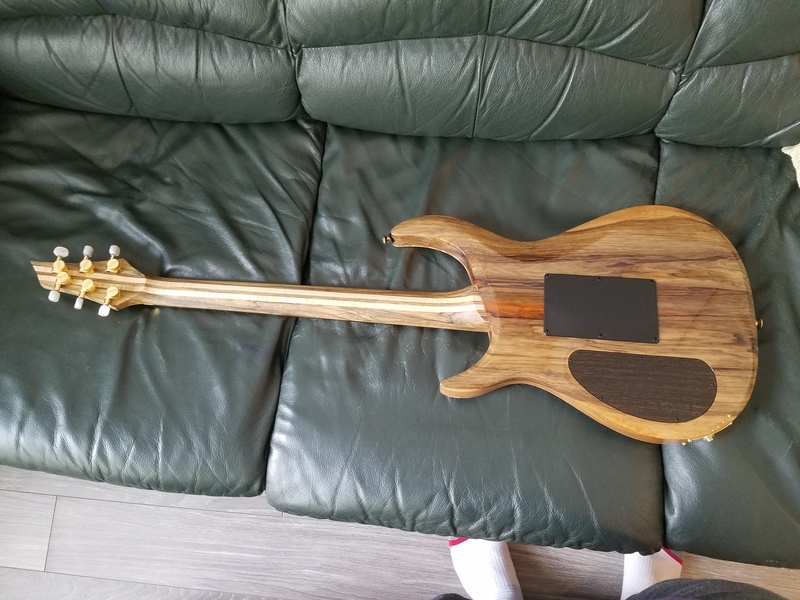 I'm also really surprised how much bite this thing has for a set neck guitar with a Floyd on it. I'm really impressed with how the lithiums coil split and how this guitar behaves when I play clean. It's a really resonant instrument and the coil-split neck pickup in particular sounds like heaven when I dial down the gain. All, in all, she's exactly what I was looking for when I specc'ed this one. Last edited by SolidOrangeTiger on Thu Jan 17, 2019 4:20 pm, edited 3 times in total. Why sir must you do this to me? This is a G.A.S. producing photo! Congrats on your beautiful instrument. Enjoy! I'd just call it "perfect." So, about that... 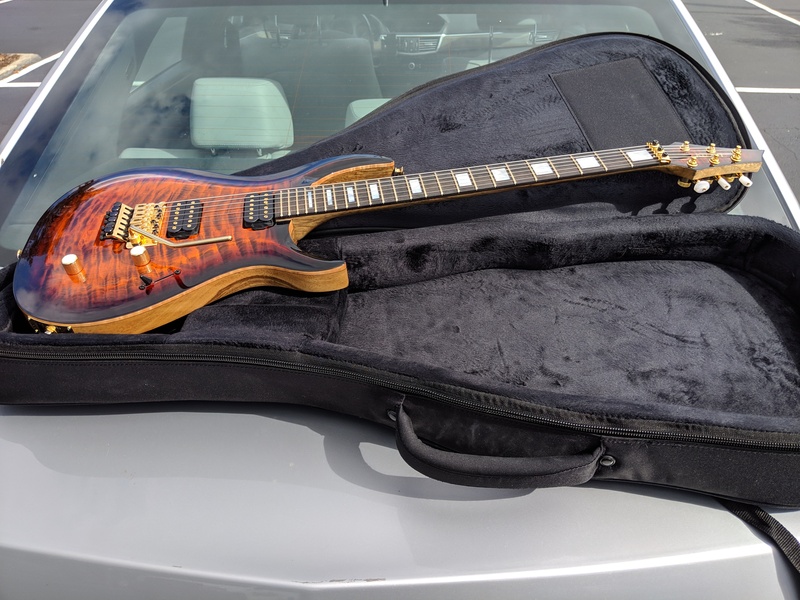 I took this guitar with me to meet a friend after work yesterday... Snapped this photo in the sun when I grabbed lunch. Gorgeous! 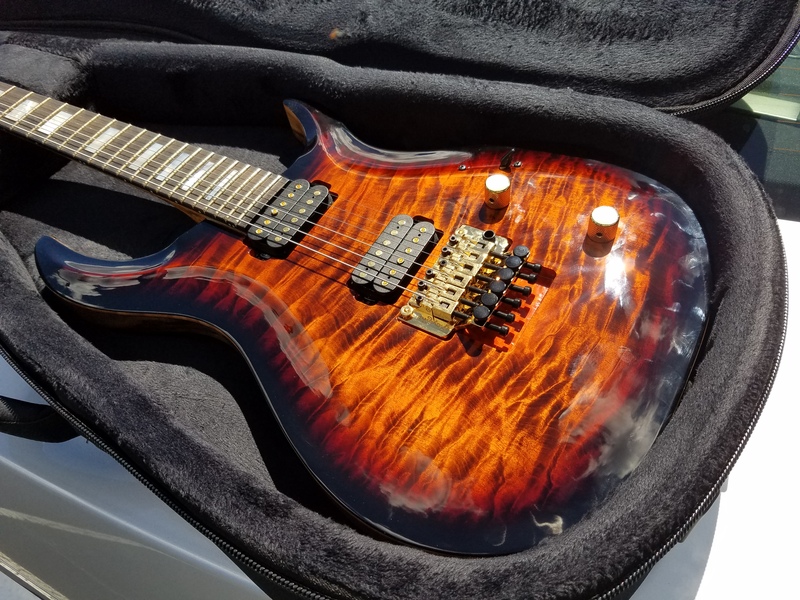 Deep Orange and Deep Lava are my two favorite Kiesel stains. 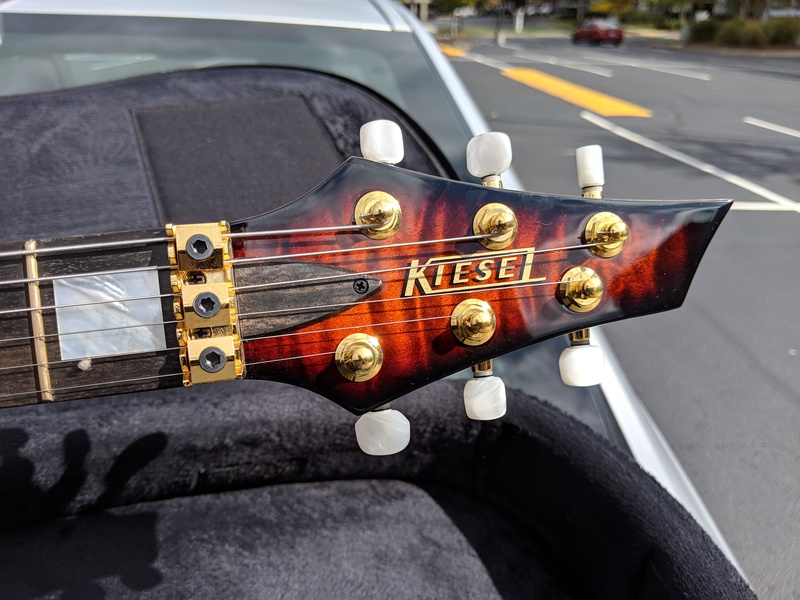 I like how Kiesel is doing the burst edges. 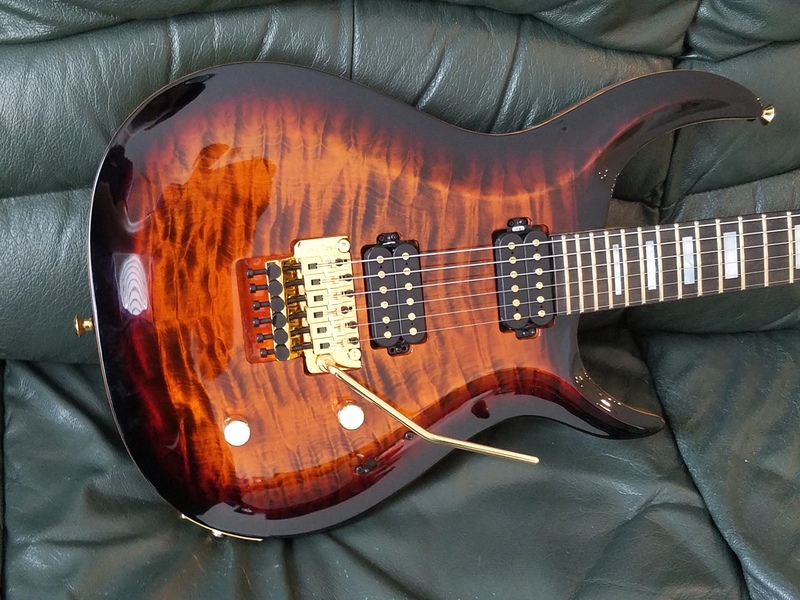 When Deep Orange was first released by Carvin they did a simple black to orange transition which I was not crazy about. Adding the red transition makes the burst look sooo much better, IMO. Omsong wrote: Adding the red transition makes the burst look sooo much better, IMO. It's one of those guitars that come together in a way that's just an instant classic. Love it!